As every first weekend of October, 6 and 7 They were very intense in the Spanish villa CovarrubiasDuring these two days the competition was held "Notes of Norway" I am meeting point of the tribute to the Princess Kristina of Norway which it is buried in the Colegiata of Burgos town. 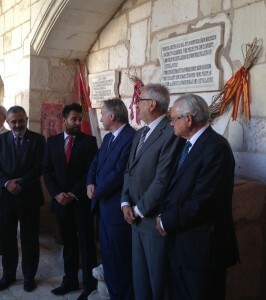 Manuel Medina, President of Princess Kristina Foundation, accompanied by the Ambassador of Norway in Spain, Helge Skaara, The deputy of the Government of Burgos, Pedro Luis de la Fuente, the Territorial Secretary of the Junta de Castilla y León, Lorenzo SaldañaThe Mayor of Covarrubias, Óscar Izcara, Patrons of the Foundation and racheles atabiados perfectly with medieval clothes, They paid tribute to Princess Kristina with a wreath Before his statue which it is at the entrance of the Collegiate Church of San Cosme and San Damián. Later another floral bouquet was placed in the cloisterWhere the princess is buried in a beautiful Kristina Gothic tomb. Covarrubias he received another year, the Norwegian musicians who were part of the cartel "Notes of Norway". This musical event first held in 1996, when Norwegian artists began arriving sporadically to this villa. Since 1999, with the collaboration of the Royal Embassy of Norway, Princess Kristina of Norway Foundation and the City rachelo, Those musical and cultural events in an annual event called formalized "Norway notes ". This event features artists and guests quality. Saturday took place in the amphitheater of the Chapel of St. Olav a concert by Anne Kolsto, musical artist, in duet with Øyvind Rosrud and the Plenary Hall of the City Hall recital "poetic journey with Princess Kristina" by Cristina Ugalde and Luis Cañada. Sunday after the wreath to Princess Kristina could hear a concert inside the Collegiate Church in charge of the whole Trondheim Barrock which he featured some of the best pieces of the repertoire of the great Baroque composers. Throughout the weekend there was a market where you could find local handicraft products, salmon and Norwegian books in Spanish version. 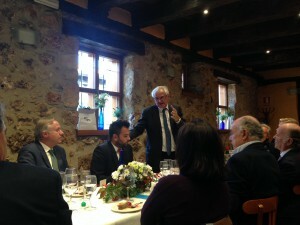 Subsequently organized a meal of twinning, in which the Royal Norwegian Embassy in Spain served as host, where the ambassador Helge Skaara He uttered a word of thanks to those present, Oscar Izcara, Mayor of Covarrubias did the same on behalf of the racheles and later Manuel Medina, President of the Foundation, thanked everyone for the succession scheduled for this special day in honor of the princess events, and was very excited about ties uniting these two countries, since the Norwegian princess arrived in Spain from Bergen in 1234 to marry Infante D. Felipe, brother of King Alfonso X El Sabio. Princess Kristina undertook a long journey from his native Norway to Castilian lands to marry the Infante Felipe. Four years after his bond, Princess Kristina died in Seville. Her husband had been abbot of the Collegiate Church of San Cosme and San Damián de Covarrubias, sent buried in the cloister. As a tribute and remembrance in 1978 was erected at the foot of the Collegiate a bronze statue of Princess, which was a gift from the people of Tonsberg (Norway) to rachelo municipality.